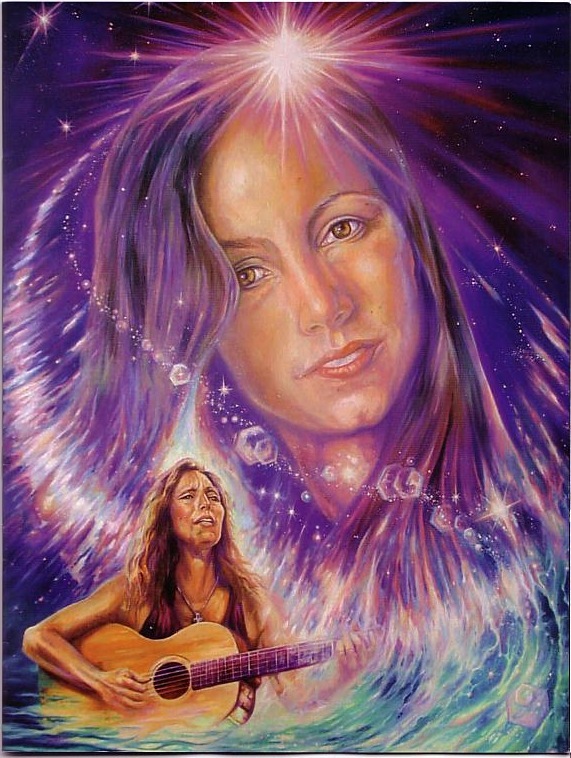 This special event was Julie Felix’s 70th Birthday concert. Will and I had seen Julie once before at a free concert in Hyde Park in the 70s, but I’d never been to see her since then. I have a few of her albums and thought it was time to see her again, and was intrigued at the thought of going to her birthday concert. So Will and I went along to the Sage to see Julie, along with fans from across the country who had come to celebrate her birthday with her. It was obvious that many of the people in the audience knew each other and knew Julie; and that they had travelled from all over the UK to come to this concert. The stage was decked with balloons to celebrate the occasion; Julie came on stage dressed in a white trouser suit; she looked great! For her first set Julie focused on songs by her 60s contemporaries, some of which appear on her latest CD Highway of Diamonds. These included Bob Dylan’s A Hard Rain’s Gonna Fall, Buffy Sainte-Marie’s Universal Soldier; and Leonard Cohen’s Hallelujah. Each of these songs was accompanied by a story of her memories of her meetings with the writer in the 60s. In the second set Julie sang a selection of her own songs, a couple of which were in Spanish. I didn’t know these songs, but they all sounded pretty good. The crowd gave her a standing ovation at the end, and everyone seemed to agree that it had been a pretty special event. Will and I certainly enjoyed it. 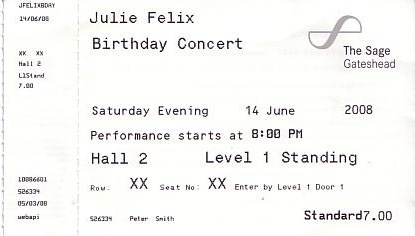 I too was at the Sage in Gateshead to witness this fine performance by legendery 60’s folk icon Julie felix as she celebrated this special birthday. This year has been a special one for Julie in more ways than one. Yes, she celebrated her 70th birthday on stage in front of family, friends and many of her fans. 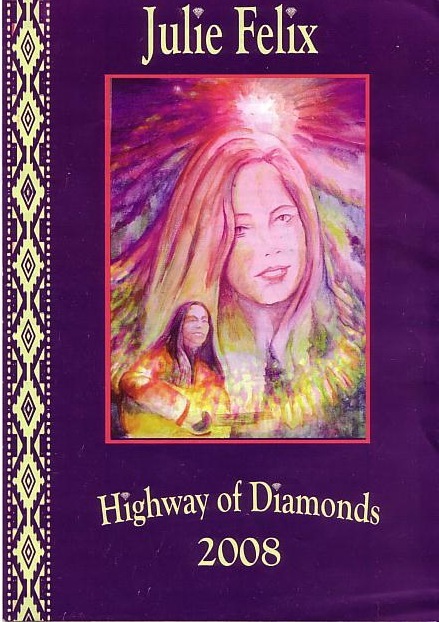 Julie also released another great album, entitled ‘Highway Of Diamonds’, it contains classic tracks including, Tim Buckley’s ‘Morning Glory’, Buffy Sainte-Marie’s ‘Universal Soldier’ and a small handfull of Bob Dylan compositions, that include, ‘Forever Young’, ‘Mystic Garden (Ain’t Talking)’, ‘What Was It You Wanted’ and ‘(Man In) The Long Black Coat’. Julie also wrote some songs for the album – dedicated to the spirit and memory of the late & great record producer Micky Most, too. Well worth a listen is this one! Finally RPM Records have re-issued Julie first three albums that she recorded for Decca in the mid-sixties. The two CD package entitled, First, Second and Third (Complete Decca LPs 1964 – 1966) is a project that has been overlooked for far too long.